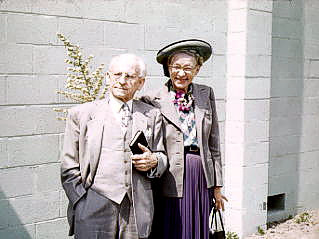 In the middle 50s I got to hear George Bennard and his wife sing The Old Rugged Cross in my home church in Doney, California. Hubris? You better believe it. To my young imagination, it was like hearing the Apostle John recite the book of Revelation. George Bennard was a pastor in Michigan before he was well known as the author of the hymn, but George was never spoiled by the notice he got. He was common as an old shoe. "The Old Rugged Cross" has to be one of the world's favorites. When my wife and I were on deputation to go to Ethiopia as missionaries, we met George's wife in the foyer of Grace Bible Church in Granville, Michigan. She was so gentle and sweet, and she handed us a cash gift for the work. She was in her 90s. I suppose you can guess-- this is one memory I hold dear. But, I want to take just one liberty with "The Old Rugged Cross." I hear of folks who don't like to sing it because the chorus says, "I will cling to the old rugged Cross..." We too were bothered with the "cling to" part. It sounds a bit Roman Catholic. I know George didn't mean it that way. He was a real Bible believer, but a change would be in order. So we sing, "I will sing of the old rugged Cross..." Hymns are NOT inspired, so we can change them. We do it all the time, especially with some of these light weight choruses in the chorus books. If you won't change a hymn to come in line with the Word of God, you are treating the hymn writer like a guru rather than a fellow servant. George Bennard would not complain anyway. There is no Cross in heaven, where George is, to cling to.